Besides studying with his two eldest brothers, Giovanni also studied with Albert Jean Adolph at La France Institute, The Pennsylvania Academy of the Fine Arts*, The Graphic Sketch Club, and Spring Garden Institute in Philadelphia. In his mid teens he accompanied his two eldest brothers to New Hope searching for subjects to paint. 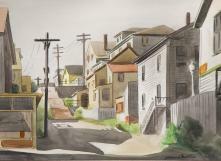 In the 1930s, he also started to paint in Manayunk, a hilly mill town along the Schuylkill River. At this time he signed his paintings M. Giovanni. These colorful impressionistic* works proceeded more thinly painted dramatically poetic street scenes of the mill town. These images developed into impasto* laden oils in the 1960's with some of the paintings worked with a palette knife*. youngest daughter, Babette. His paintings became more sharply executed like his earlier work but were more colorful. In the late '90's he worked in his studio to enlarge paintings. He is the recipient of over 100 awards and honors. He received the Benjamin Altman Prize in Landscape Painting in 1975 at the National Academy of Design, NYC where he was elected an Academician (NA) in 1944. He mentored not only his wife and two daughters but also taught at Lehigh University and the Graphic Sketch Club, Philadelphia. He died at his home in Blue Bell on February 1, 1998.